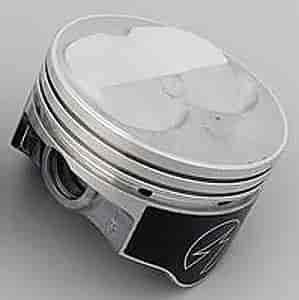 For street, bracket racing, and oval track applications, these aluminum hypereutectic pistons feature an antifriction skirt coating that is highly resistant to scuffing and wear. They operate with tight bore clearances and work perfectly with normal ring end gaps. Note: All compression ratios are approximate and figured with a gasket thickness representative of those commonly used. Pistons designed for floating pin only applications include lock rings. The ACP/DCP series pistons are designed for pressed or floating pin and do not include lock rings.